In June, 1910, I. M. de Varona, chief engineer of the Department of Water Supply, Gas and Electricity of the City of New York, made trials of hypochlorite treatment in connection with the Croton water-supply. The results were so satisfactory that its use has been extended until the city now maintains five of these plants: one on the New Aqueduct at Pocantico, treating the entire supply from the Croton, and the other four upon various tributaries of the reservoirs. The continuous treatment of the flow of the New Croton Aqueduct was commenced in June, 1911, the plant being located at Shaft No. 9, north of Tarrytown, N. Y., known as the Pocantico plant. It consists of a rough frame building which houses two cement-lined cypress tanks, 12 ft. in diameter and 6 ft. in height, and a constant-level feeding tank with adjustable orifice discharging through a manhole into the crown of the aqueduct. Within the aqueduct, there is suspended a wooden grid to secure a proper mixture of the chlorine solution and the flowing water. The operating floor is just above the solution tanks and in it are two screened mixing pits. 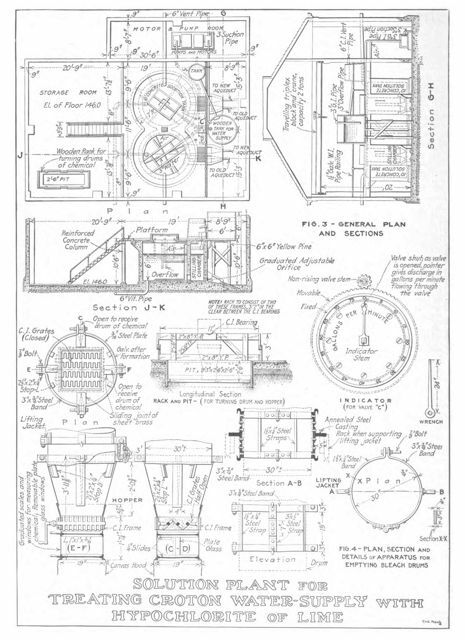 In operation, a drum of lime, weighing about 800 lb., is rolled into position over a pit and the contents washed out into the pit by a hose stream under pressure. Enough ‘bleach’ is dissolved to treat the aqueduct flow for 12 hours. The tank is then filled with water and stirred to assure the thorough absorption of the chlorine. Four men operate the plant, two on the clay shift, making solution, and one on each of the night shifts, maintaining a constant, uniform flow of the solution. Reference: Coffin, T.D.L. 1913. “Chlorinating Plants, Croton Water Supply.”Engineering News. 69:9(February 27, 1913): 419-21. Commentary: New York City began testing chloride of lime to disinfect the Croton water supply shortly after the findings of the special master in the second Jersey City trial which has been described at length in The Chlorine Revolution: Water Disinfection and the Fight to Save Lives. 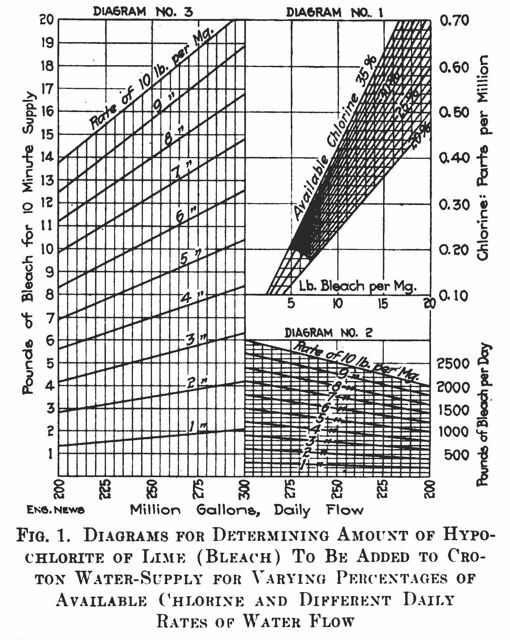 This entry was posted in Year 7 TDIWH and tagged chloride of lime, chlorine, Croton aqueduct, disinfection, drinking water, New York City, public health, water, water history on February 27, 2019 by safedrinkingwaterdotcom.